What’s better during the winter than spending a quiet night at home reading a good book? Novel, poetry, scientific article or theoretical book, you just have to find what you prefer. I have personally been a very small reader for many years (to my father’s great despair who literally devour them) before discovering that I was more attracted to theoretical books than novels. Since then, I’ve been reading almost every day. 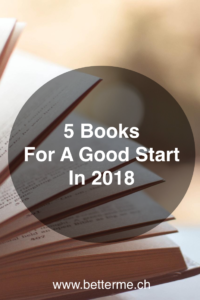 I advised you 5 books not to miss in 2017, here are today the 5 books that influenced my year and that I strongly recommend you if you want to start 2018 in an inspiring and creative way! Tim Ferriss’ classic. In times of resolutions and goals setting, this is the book you want to read! This author tells you how to automate your work and maximize your free time so that you can enjoy every moment of your life. This book is full of advice on negotiation, how to start a business, delegation, etc. Sometimes ethically questionable, it will however not fail to change your vision of work. Just take what you want from it! You want to change some of your behaviors and take new habits? Start this book right now! It analyses in depth the mechanisms of habits and how it is possible to change them. It shows many concrete examples (from Michael Phelps to Martin Luther King Jr. and Howard Schultz the CEO of Starbucks) that the key to success lies in setting up good habits. Make sure you don’t have a busy schedule when you start this book because there’s a good chance you won’t be able to get your eyes off it! This book explains in detail the mechanisms of our thought process and why our instinctive decisions are sometimes (or even often) better than those for which we have spent hours weighing pros and cons. Many examples from scientific studies and real-life cases greatly enrich this book. Don’t be afraid of the title that looks more like an advertising scam than a reference book. Because, if you are interested in personal development, this book is one of the basics you need to start with. The author addresses many topics such as values, interdependence, time management, amongst others. If you sometimes feel uncertain about the choices you make in your life, this book might help you clarify your reasoning. This is my absolute favorite this year, because this book has captivated me from beginning to end. Sogyal Rinpoché, a Tibetan lama who has followed a Buddhist but also a Western education in India and England knows how to simplify complex concepts. It sums up a multitude of Buddhist concepts as well as meditation methods before diving deeper into the theme of death and how to grasp it in the best way. This book is a real treasure for people who wish to accompany individuals at the end of their lives because it offers lightness to a topic that isn’t easily dealt with in the Western world. That was a great news for my English-speaking followers: my ebook “Boost Your Self-Confidence In 14 Days” has finally been released at the end of 2017! Grab your copy if you want to increase your self-confidence in the long term using the 14 exercise sheets that have been built based on scientific research of the last 20 years in the psychological field. Hera are my reading recommendations for 2018. I would like to send you my best wishes for happiness and health. May this year be filled with pleasant surprises and challenges. Enjoy your reading!